Flea beetles are one of the earliest vegetable pests to be seen in crop fields in spring. They attack many vegetable crops grown in New Jersey. Several species can be found throughout the year, including the cabbage flea beetle, corn flea beetle, crucifer flea beetle, horseradish flea beetle, eggplant flea beetle, palestriped flea beetle, potato flea beetle, spinach flea beetle, striped flea beetle and the sweet potato flea beetle. They generally have 1-2 generations per year, and overwinter as adults, usually in soil and litter or other protected areas, becoming active in early spring; early April – May in New Jersey. Flea beetle adults feed on the leaves, chewing small holes in the foliage. However, when feeding is extensive and the leaves become riddled, the adjacent tissue dies or dehydrates, and the leaf takes on a bronzed or burned appearance. Leaves will die and drop off the plant. Some species, such as the corn flea beetle, can completely skeletonize leaf tissue of seedling corn, often defoliating the plants. The corn flea beetle adult also transmits a disease, Stewart’s bacterial wilt of corn, which can stunt or even kill corn plants infected early in the season. Larvae are generally root feeders, and several species occasionally cause considerable damage to roots and tubers. For most crops, a flea beetle thresholds have not been developed. 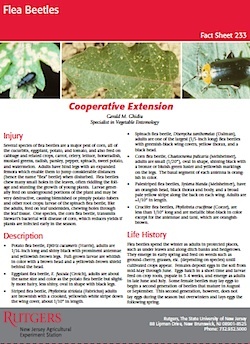 For crucifers, a control tactic is suggested if there is one beetle per plant during the seedling stage of crop growth. In sweet corn, treat susceptible (to Stewart’s wilt) varieties at spike stage of crop growth when 5% of the plants are infested. See the 2014 Commercial Vegetable Production Recommendations guide for control measures for individual crops. At-planting and post-planting applications of insecticides are both ways to help control this pest. When foliar sprays are needed, applying insecticides during warm, sunny weather when adults are active on the plants will result in better control. Make sure to obtain thorough coverage of the foliage. Monitor the field after spray application to assess effectiveness. Even if good control is obtained, keep monitoring or scouting flea beetle populations as reinfestations can occur quickly during warm weather.